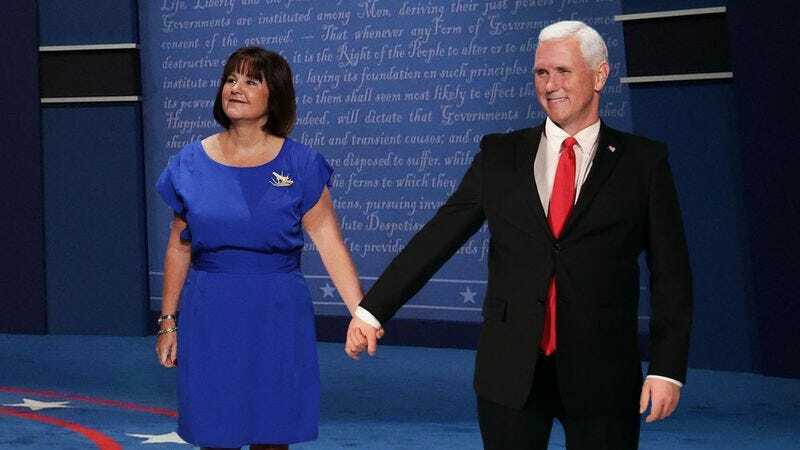 FARMVILLE, VA—While explaining the virtues of traditional family values during Tuesday’s vice presidential debate, Republican nominee Mike Pence reportedly called his wife, Karen, up onstage so that the pair could demonstrate how much physical contact is appropriate before marriage. “In order to preserve the moral character of this great country, it’s important that everyone knows what behavior is and is not acceptable for unwed couples, so allow me and Karen to show you: A light pat on the shoulder is okay, strolling hand-in-hand is okay, and brief hugging is okay too, so long as it’s kept to less than a two-Mississippi count,” said Pence, performing each act with his wife of 31 years on the dais at Longwood University while reminding viewers they should remember to “keep the embrace above the waist” with no lower-body contact whatsoever. “But maybe many Americans out there have got a gal who they’ve been steady with for quite some time. In that case, a little peck on the cheek—like this—is fine now and again. Did you see how that was done very quickly, with lips tightly closed? Remember, though, under no circumstances should you be dancing together. You save that until after the union has been sanctified.” At press time, Pence was reportedly showing the audience how couples should behave after marriage by nodding in recognition at his wife’s assistance and then firmly instructing her to quietly sit back down in her seat.